“I didn’t expect this, and as the day got closer, I was overwhelmed by the caring of my friends and family." As a touring Métis musician in the 1960s, Manitoba’s Charles Nabess had to assume the pseudonym “Carlos” to perform on some stages, and was introduced to audiences as a Spanish guitar player. “Promoters couldn’t deal with a Native leader of a band touring and emulating stars like the Rolling Stones and the Beatles – the bands that greatly influenced Charles,” said David McLeod, of Manitoba’s NCI (Native Communications Incorporated). He sat down with Nabess to talk about his trailblazing career some months before the musician’s death on May 6, 2014. Nabess commented that even though his band Three Penny Opera was playing great music and he was literally blowing the stereotypes away about how Aboriginal people couldn’t reach that level, the band encountered racism and cancelled some bookings. Early on the priests and nuns in his childhood community warned Nabess that his music would never amount to anything. “It’s a good thing he didn’t listen to them, because he went on to travel the world with his music and he allowed many of us to dream and to think about having careers in music,” said McLeod. Nabess taught himself to play the guitar at 10 years of age while growing up in Thicket Portage in northern Manitoba. He was the second youngest of a family of 12 children born to Marie and Patrice Nabess. When he was 16, he and his 13-year-old brother Donny, a singer, moved to The Pas where they began performing. They formed The Midnight Angels after moving to Winnipeg in 1963, and performed exuberant covers of current rock bands that inspired them. “They wrote original music, too,” said McLeod. “Charles’ guitar playing was central, with his impassioned style and impeccable timing.” The band signed to Apex Records in 1967, recorded in Toronto and released the radio single “I’m Sufferin” and then began touring. When the record deal ended in 1968, members Donny and Charles renamed the band Three Penny Opera (named after the Berthold Brecht play) and continued touring on their reputation as a tight, live band. The group played throughout North America and Europe – performing often on cruise ships – until 1992, assuming many incarnations along the way. In 2011, Nabess appeared on the Native Communications Incorporated Jam Stage at the Pantages Theatre for a segment entitled The NCI Guitar Heroes, along with Billy Joe Green, Jimmy Flett, and Gerry McIvor. The performance received a rousing standing ovation. “It was so outstanding and so loving because these guys have been there since the 60s and they made music their lives. Nobody’s gotten rich in their music career from doing it, but they’ve committed their lives to it. They’re the ground breakers, the trailblazers,” McLeod explained. 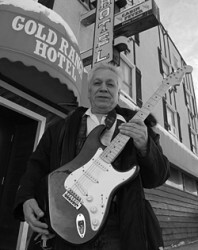 Before returning to Winnipeg in 2005, Nabess spent six years as the leader of a house band in Yellowknife, N.W.T. Throughout his career he wrote songs, taught music, was a mentor to many in the industry, and was admired for his gentlemanly, kind disposition. When he became ill and began aggressive chemotherapy, the treatment was not covered by medical services. “Like many musicians, you only have money coming in to pay for the rent and groceries when you play,” said McLeod. Fellow musicians came to the rescue, with friend Oliver Boulette pulling in many for a fundraiser at the Essence Club. The evening included Billy Joe Green, and Percy “The Reverend” Tuesday among others. “I’ve been playing with Charlie now for five or six years and we’ve been doing a lot of fundraisers. We’ve been out helping people and all of a sudden Charlie comes down with cancer. You have to help your own when something like this happens,” said Boulette in a video filmed at the Fundraiser for Charles Nabess on Youtube. After delighting crowds with his signature version of “Sultans of Swing” during the fundraiser performances, Nabess was also interviewed on the Youtube clip. “I didn’t expect this, and as the day got closer, I was overwhelmed by the caring of my friends and family. And the way it feels right now, my family and friends are here to save my life. Isn’t that amazing? “My time in music has made me realize that my work is about the people and the music and not only about the money. We all have a heart, so the music should come from there,” he said. Surrounded by his musical friends, and many family members who are also talented performers in their own right, Nabess looked visibly moved, though weak, by the outpouring of support. He was 68 years old when he passed away some months later, and is survived by his second wife, Kris, whom he married in 1984, five children and seven grandchildren.